Looking north from lilli Midtown’s 25th floor. There’s no doubt that Midtown is one of the buzziest neighborhoods in Atlanta at the moment. When Midtown Alliance took stock this spring, there were 30 major development projects underway in the neighborhood’s 1.2-square-mile core. Since 2000, Midtown’s resident population has boomed, growing five times faster than the City of Atlanta as a whole. This level of enthusiasm and investment is business as usual for most of Midtown, but its arrival at the neighborhood’s southernmost blocks is more recent. 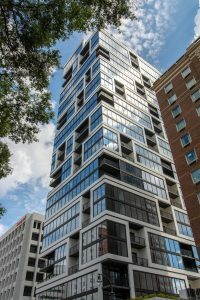 This trend is most clearly exemplified by the opening of lilli Midtown, a boutique high-rise apartment building with a classically modern design. The slender tower with big presence is surrounded by major new and upgrade projects, harkening a new era for the historic heart of the neighborhood. 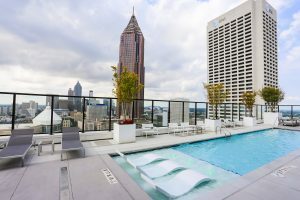 lilli Midtown sits on one-third of an acre between the Hotel Indigo Atlanta and recently-renovated office building 715 Peachtree. lilli Midtown is the creation of JPX Works in partnership with Atlanta apartment developer Mariner Group. JPX Works burst onto the commercial real estate scene not long ago with Inman Quarter, promising to bring an intense focus on design to its Atlanta developments. To deliver on that promise in Midtown, JPX Works founders Jarel Portman and Bruce Fernald brought in ODA Architecture from New York, whose striking modern designs dot the skylines of New York’s five boroughs, as well as those of Toronto, Berlin, Washington, D.C., and Jerusalem. The sleek white building with black accents sits on just 0.31 acre, rising 25 floors above Peachtree Street on what was previously a stubbornly vacant site. Though it’s small in scale compared to most of the new apartment buildings we’ve seen in Atlanta (with just 147 units, lilli is technically a boutique building) each unit has 200–400% more glass than its peers in and around Midtown. The major natural light pouring in through all those windows illuminates inside what is already clear before even entering an apartment here—there is nothing else like lilli Midtown in Atlanta. As fun as it is to look at this building from the street, looking out from it offers just as much entertainment. If you have the opportunity to visit its 25th floor clubroom and pool deck you will not be disappointed. The views in all directions are breathtaking. A south-facing view from the lilli Midtown 25th-floor pool deck. From the top floor of lilli Midtown, one can easily see just how much developmentis arriving in south Midtown. You may first notice the Fox Theatre’s new rooftop feature—the Marquee Club. The membership-only club has created the first opportunity in 65 years for anyone to access the roof of the historic theatre. The club is 10,000 square feet in total, featuring five bars and a capacity for 400 guests. This significant hospitality addition to the neighborhood marks a major new phase for the landmark theatre that was rescued from the wrecking ball just over 40 years ago. Speaking of hospitality, lilli Midtown’s next-door neighbor, Hotel Indigo, is in the midst of a nearly $9 million makeover. This historic property has been a south Midtown presence since the 1920s, and operating as Hotel Indigo since 2004. In fact, this was the first Hotel Indigo to open after locally-based, global hotel company IHG launched the brand, consisting of boutique hotels that represent their neighborhoods authentically. Its most recent renovation includes major upgrades in guest rooms, and more minor sprucing up in the common areas and exterior. Westward views from lilli Midtown’s top floor club room provide a front row seat to the construction of Coda Tech Square. 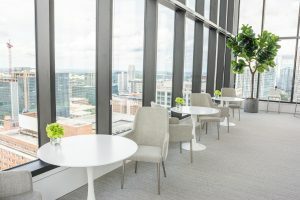 If you direct your gaze north from the rooftop clubroom at lilli Midtown, up Peachtree Street, you’ll see that office buildings in the area are keeping up the renovation trend. 715 Peachtree was recently adapted by Carter USA to become the new Midtown home of Honeywell, and other technology-focused businesses. However, the reinvigorated building has much more to offer. In addition to the colorfully modern co-working club, called Spaces, the basement of this building hides a Stone Summit gym—where experts keep the rock-climbing wall fresh by changing the layout every few weeks. 730 Peachtree, just across the street, will complete its own renovation this year. Construction is underway on this midrise office building’s facelift that will include a new plaza and restaurant on Peachtree Street. Finally, looking westward out of lilli Midtown’s sleek rooftop lounge, you’ll see Coda rising in Technology Square, which will cement Atlanta’s status among U.S. cities driving technological innovation. The cutting-edge office building will lease space to both Georgia Tech research labs and companies seeking the best possible location for their innovation centers and R&D facilities. It’s expected to becomesome of the priciest office space in Atlanta when complete in March of next year, not to mention a major dining destination on the ground floor. It will soon be joined by two more Portman Holdings office buildings on adjacent blocks. 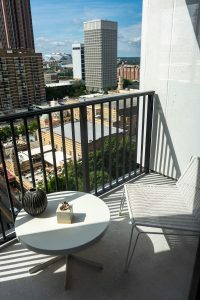 The Fox Theatre Marquis Club rooftop lounge is visible from one of lilli Midtown’s inset balconies. 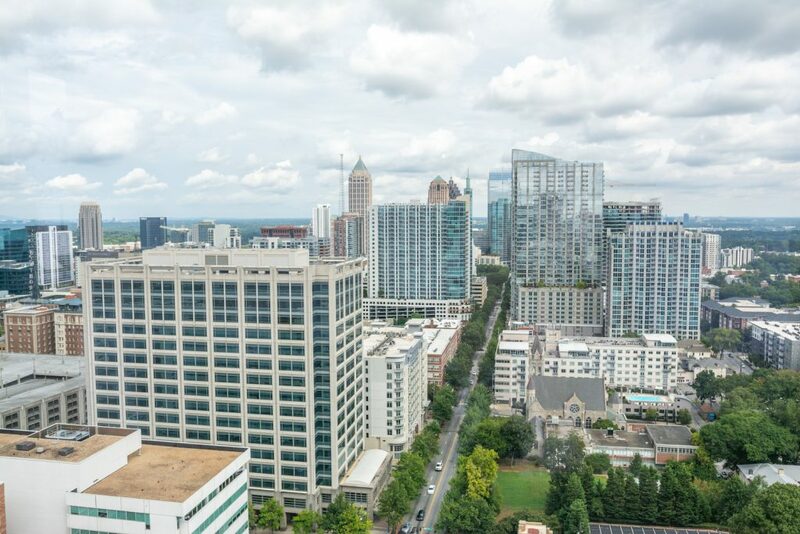 Even before the above mentioned 1.4 million square feet of office space opens, Midtown houses one quarter of Atlanta’s professional, technology, science, and management jobs, which are forecasted to grow 41 percent over the next 10 years. It’s home to 20 percent of our finance and insurance jobs, expected to grow 56 percent in that same time frame. South Midtown looks entirely different now than it did just a few short years ago, and with all this anticipated growth, it’s sure to keep evolving. Keep an eye out for more exciting news from this important part of our most bustling neighborhood. We are particularly looking forward to learning about the restaurant that will inhabit lilli Midtown’s prominent retail space at the corner of Peachtree and Third Streets. If the thrilling design of this building is any indication, the dining promises to be spectacular.